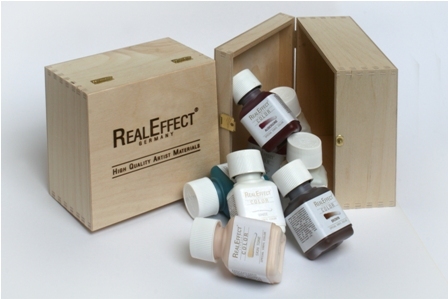 Wooden box with the logo "Real Effect" to store 9 bottles of Real Effect paint. This is for the box only, there are no paints in this offer!!! Houten doos met het embleem " Echte Effect" kunnen 9 flesjes van de Real Effect verf opgeborgen worden.